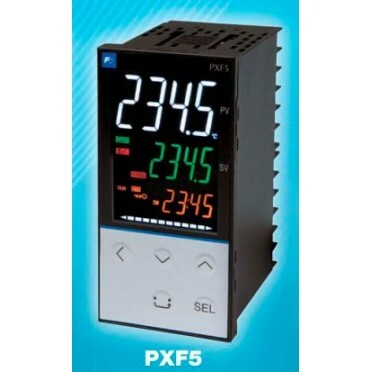 In addition to 9 types of temperature control functions including on-off control, heating/cooling control, and 2-degrees-of-freedom PID, useful functions such as multi-drop control using RS-485 network and simple watt-hour monitoring are available. All these features make PXF practical for any applications. Universal Input, Tallest PV Characters in the Industry, Compact Design, Parameter Setting Available on PC. Power Consumption : 13 VA MAX. Features & Specifications :Dual Display, Single Set Point Economy Temperature ControllerSingle s.. Features & Specifications :2 setpoints, Relay / SSR selectable for control outputDwell timer, Au..